The M&A Law Firm is the only law firm dedicated to advising middle market ($10M to $200M) business owners in the sale of their businesses. 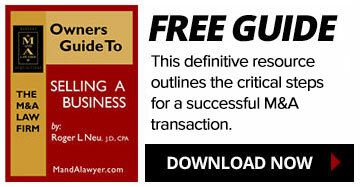 The following is a brief explanation of some of the services provided by the M&A Law Firm. The M&A Law Firm takes charge of the sale process at the outset to make sure that your business is properly prepared to go to market and then coordinates and directs each step of the sale through the closing. Packaging the Company for Sale. If you want the most value for your business you have to know how to properly “package” your business and present it to the market. We know what buyers are looking for and what adds value. You will be introduced to the revolutionary concept of “seller diligence” which will be your single most important tool in assuring a successful closing at the highest value. Selecting the Right Investment Banker. Through our national and international network of investment bankers, we will give you the opportunity to meet and select those investment bankers that know your industry and your business and are the most qualified to find the best buyers. All aspects of; (i) the preparation and presentation of the offering materials; (ii) preparation of a virtual data room with your company information; (iii) confidentiality arrangements; (iv) solicitation of offers; and (v) analysis of buyers and offers will be coordinated by The M&A Law Firm with you and your investment banker. From Letter of Intent to Closing. We make sure that the structure of the transaction is the right structure for you with minimum taxation. Documents are carefully prepared and reviewed as required to make sure your interests and objectives are met. Attorneys specializing in environmental law, intellectual property, employee benefits, insurance, succession/estate planning, real property, labor law, regulatory matters, etc. are readily available to make sure you are represented at the highest level.